Seattle woodworker Nathie Katzoff, owner of NK Wood­working & Design, is earning something of a reputation as a stair artist. 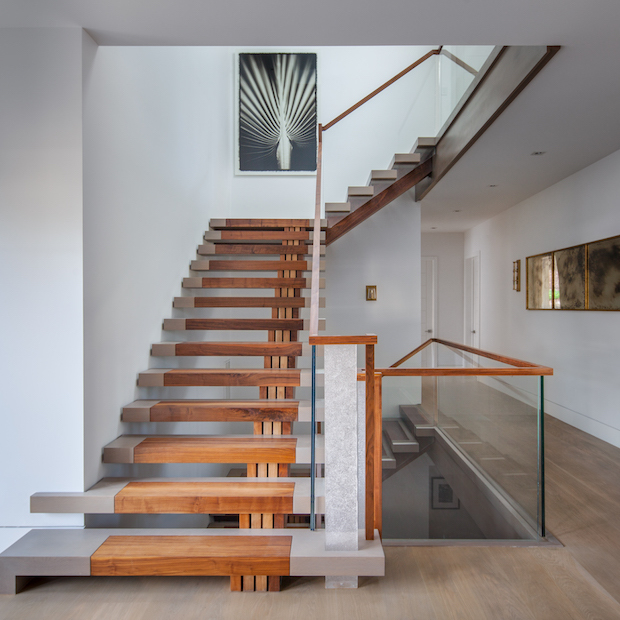 So, for art collectors in search of an entry staircase to function as the home’s focal point as well as a piece of sculpture, Katzoff was the logical choice. Referred by the home’s architect, Katzoff faced a challenge: design, build, and install a stair that would fit gracefully with the rest of the home, yet make its own statement. The stair treads are a combination of black walnut and treated white oak. The four visible stringers at the right of the run are also black walnut, mixing clear finish walnut and bleached walnut for varying tones. 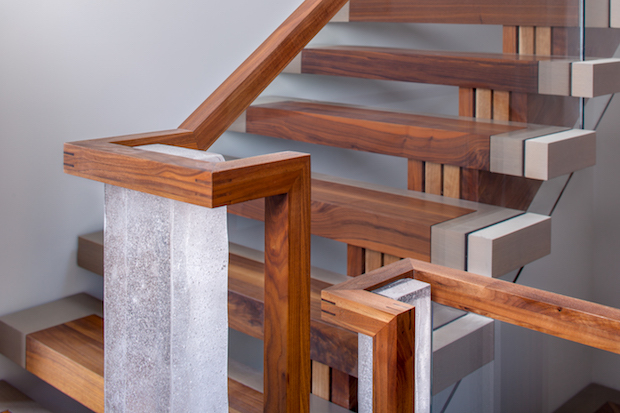 A walnut handrail wraps around hand-cast glass newels that resemble blocks of ice. Katzoff’s aim was a modern play on the traditional flourish of a stair rail volute. The design was first drawn by hand, then a 3-D model was built in the shop, “so the clients would know exactly what they were getting,” Katzoff says. Comments on: "Design Details: Artful Entry"